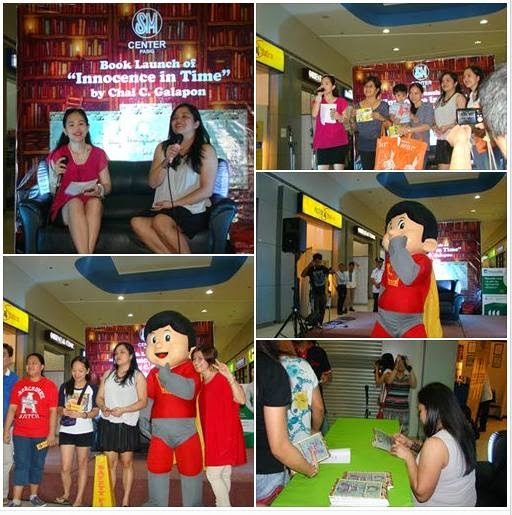 Last April 13, 2014 witnessed the launching of the “Innocence In Time” at the SM Center Pasig Health Hub Activity Area. Ms Mary of the Leasing Department, led the book launch activity of a homegrown talent and avid SM Pasig customer, Ms. Chai Castro Galapon as she shared her masterpiece. Guests and book owners won prizes in the raffle sponsored by Philips Avent, Dippin Dots, D’ InPLAYtables, Pink Parlour, CD-R King, PazzoRollio, Sweet Life Coffee, Claytoons Polymer Clay, Manulife, Walter Bread, Krispy Kreme, Adflix Manila and Books on Demand. Chai started writing the book in February of 2011 and finished it by the end of August the same year. It was shelved because the budding author no publishing experience and still has to learn the rudiments on how to go about having her book published. Hence, it got published only now. This fiction, short story book is available in over 30 online bookstores that includes Amazon, Barnes & Noble, Adlibris and Bookwhirl.com. You have the option to get it on paperback, e-book and Kindle copy. "Innocence in Time" can be purchased at the Sweet Life Coffee in Greenwoods Executive Village https://www.facebook.com/sweet.life.coffee for 190 pesos. Please support this endeavor. For every copy of the book sold, the author pledges to donate P 20.00 to a worthy cause. Your kind generosity will help augment medical expenses of Chai's fellow mommy friend, Heart Calimlim, for the latter’s Baby Yvan (who suffers from pulmonary dysplasia). May God bless you for your generous heart, Chai.